A quality pencil sharpener is an important tool for keeping your art supplies in great condition. 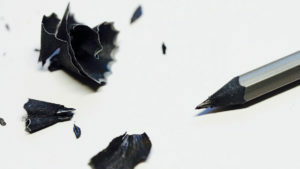 It’s useful for shaving down the wood on your pencils to show more lead, of course, but also gives you the perfect tip for creating intricate details. Some see pencil sharpening as an art form of its own, but traditional sharpeners will work for most artists. Whether you like hand crank sharpeners, simpler designed tools, or electric devices, this article will have something for you. Pencils can vary a lot in size and shape. They come in various diameters and triangular, circular, or hexagonal shapes. Although most pencil sharpeners can adequately handle varying pencil shapes, some are more suitable than others for certain shapes. This is something you want to consider when making your pencil sharpener selection. But unless you are using very unusual pencils, the items on this list will do just fine for your needs. Different pencil sharpeners also come with different sharpening angle degrees. When pencil tips have bigger angles, they expose more lead and allow you to use your supplies for longer between sharpening sessions. Pencil tips can also come with smaller angles though, which tend to break less often and offer a sturdier drawing experience. Before you choose your pencil sharpener, know your pencils.